You could say Stewart Fotheringham is where he is now because of a dogged preoccupation with that perennial question of the human condition: Why? In pursuit of an answer, the Yorkshire, England, native has studied or taught at universities across the U.K. and in North America, from Canada to Florida and New York to Indiana. His quest eventually brought him to Arizona State University’s School of Geographical Sciences and Urban Planning, where he was recently named a Regents’ ProfessorRegents’ Professors are considered the elite of the academic world, making up no more than 3 percent of all faculty at ASU. To be awarded the distinction, scholars must be full professors, with outstanding achievements in their fields, who are nationally and internationally recognized by their peers. for his scholarship in the field of spatial data analysis. The phrase “big data” is now ubiquitous as a catchall for the vast amounts of information being generated by technology users on a day-to-day basis — from traffic trends recorded by GPS to spending habits recorded by credit card companies — and it’s people like Fotheringham who try to make sense out of it so that it can be used in a meaningful way. In particular, Fotheringham looks at how that data is connected to location. “My work is all about trying to understand the real world, essentially, and why there are variations in what we see,” he said. FotheringhamFotheringham is also a Distinguished Sustainability Scientist in the Julie Ann Wrigley Global Institute of Sustainability. came to ASU in 2014 from the University of St. Andrews in Scotland. Founded in 1412, St. Andrews is extremely selective, with roughly 5,000 undergraduates and 2,000 graduate students, and what Fotheringham described as a more traditional “siloed mentality” concerning departments that sometimes engendered tension and rivalry. Some of the “why questions” Fotheringham is currently addressing with his analytical models include spatial variations in disease rates and voting behavior. In Scotland, colon and breast cancer screenings are free services, but rates of people who actually take advantage of them range from 80 to 90 percent in some areas to about 20 percent in others. From there, suggestions can be made for location-specific messaging around cancer screenings that is more likely to motivate a certain population than a blanket strategy that assumes everyone will respond to the same message. The same is true for politics. Currently, Fotheringham is analyzing the voting behavior in the 2016 U.S. presidential election using a brand-new statistical methodology. Typically, analytical models are static in that they assume an outcome such as voting behavior is based only on a single factor, such as age or income level. “That just gives you an average across the whole country,” Fotheringham explained. “What we don't know is whether that is true for every location within the country. When it comes to teaching students, Fotheringham’s favorite part is the look of recognition when they grasp such a concept. For him, those are rock star moments. And he fully embraces the ASU philosophy that education should be accessible to all. Next on the docket for Fotheringham is an ambitious project that broadens his voting-behavior analyses beyond the 2016 election, going back several years to determine what caused voting behavior in the U.S. to shift over time to the point where Americans are more divided than ever before. “Clearly in this country, we're becoming more partisan because of politics,” he said. “The differences between Republicans and Democrats are becoming stronger, and the middle ground is disappearing. I can actually map that, and I can do that through time with each presidential election, to see when and where changes occur, in terms of the effect of location on how we vote. 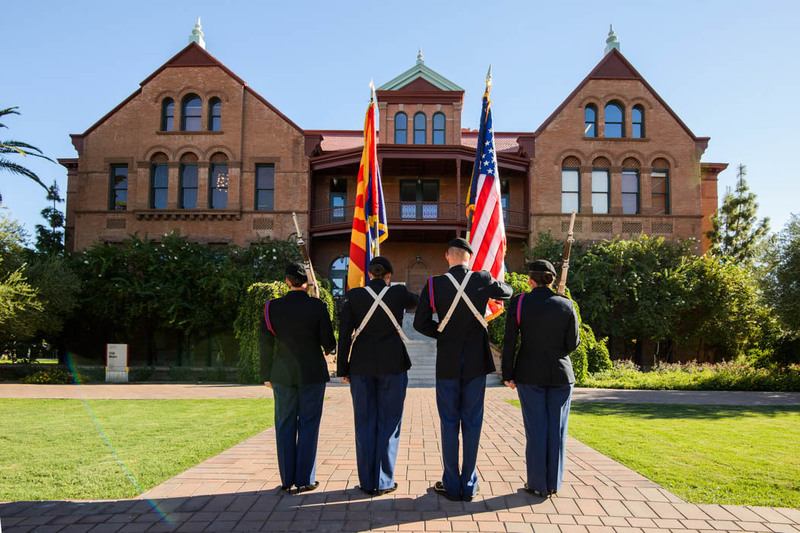 A new partnership between the Office of Distinguished Graduate Fellowships and the U.S. Army Department of Military Science at Arizona State University will identify and fully fund selected incoming master’s degree students. A/A MDFP will fund incoming master's degree students at ASU in any field of study who are interested in serving as an officer after graduation in either the Army, National Guard or the Army Reserve. The A/A MDFP award includes full tuition, a monthly stipend and an allowance for books/supplies. The funding for this program is theoretically unlimited; however, the nature of logistics and administration will put some degree of restraint on the number of students accepted into the program. A/A MDFP is a competitive fellowship, requiring an application, interviews, writings and fitness test. Current applicants to the program must be newly admitted or intending to apply and must be under 30 years of age. This program also comes with a built-in career. Students can choose their department or field (humanities-focused, STEM-focused or professional) and, upon graduation, will begin their position at an elevated pay rate and with an officer’s rank. Fellowships that both fully fund master’s degree programs and guarantee executive-level jobs immediately following graduation are very rare. This new partnership between the Office of Distinguished Graduate Fellowships and the U.S. Army Department of Military Science at ASU is a significant endeavor. For more information, register for the student information session at 3 p.m. on Feb.12 in the La Paz Room of the Memorial Union.